Last week American Express announced some awesome changes to the Premier Rewards Gold Card from American Express. In a way, American Express cannibalized their most powerful Membership Rewards product with the introduction of their EveryDay Cards. In the past I’ve compared the Amex EveryDay℠ Preferred Credit Card and Amex Premier Rewards Gold Card, so I figured I’d post an updated comparison, taking into account the changes coming to the Premier Rewards Gold Card. Welcome bonuses: Earn 10,000 Membership Rewards® points after you make $1,000 in purchases with your new Card in the first three months. Terms and Conditions apply Earn 15,000 Membership Rewards® points after you make $1,000 in purchases with your new Card in the first three months. For the average consumer I do think the AmEx EveryDay Preferred Card is a better option (since presumably the average consumer spends more on groceries, gas, and unbonused everyday spend than airfare and restaurants). But what I think is brilliant is that the Premier Rewards Gold Card is now directly competitive with the Chase Sapphire Preferred® Card and Citi Premier℠ Card. All cards have waived foreign transaction fees, and objectively the Premier Rewards Gold Card has the most compelling category bonuses. Which card you think is more compelling — the EveryDay Preferred Card or the Premier Rewards Gold Card? Nothing to do with points accrual but I hate the transparent utilitarian design of the physical EveryDay card. It looks like disposable junk in my wallet. @jason I agree…I think orange would be better. The ED and EDP cards have forex fees as listed in your table. I think you meant to say “all cards have waived annual fees the first year” instead. @Steven – That comment was in reference to the Citi Premier, CSP, and PRG. @Lucky – I wouldn’t agree with this at all: “objectively the Premier Rewards Gold Card has the most compelling category bonuses.” With no bonuses for hotels it lags behind both CSP and CP; the Citi Premier’s wide definition of travel—including gas, parking, etc.—at 3x (after April) is especially compelling. @ Steven — At the bottom of the post? That was referring to the three cards listed immediately above it — The Citi ThankYou Preferred, Chase Sapphire Preferred, and American Express Premier Rewards Gold. i have green AMEX, and gold reward AMEX seems attractive enough to upgrade. do AMEX allow upgrading from the green to gold? if it is allowed, do i still get the sign up bonus? The AX Premier Gold rewards for 3x airfare has a $100K limit. I reached that in January and then switched all spent to Sapphire preferred as its 2x unlimited. Anyone know of a 3x airfare with no cap? Paul: Sure. The Citi Prestige and, after April 19, the Citi premier as well — both are 3x on air. Thanks Tom. The thank you points don’t have as many transfer partners as UR or AX. Would you take UR at 2:1 on charges or Thank you points at 3:1? 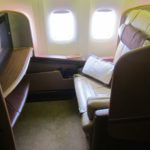 Redemptions I use as business class Seattle origination flights principally to Europe and South America for friends and family. Lucky, the Amex Everyday cards both have a very low cap on the US Supermarkets category, up to $6,000 per year in purchases(then 1x). That means the potential of the Everyday card in earning category bonus is limited. If I could use the Amex PRG for business airfare and travel expenses that would be the winner hands down, but unfortunately I have to use my company Visa which earns me squat. The 1.5 times on everyday spend + the grocery bonus makes the Amex EDP card better for me. In looking at Amex’s site at this offer, I don’t see the $100 credit that you’re referring to, and I see that there is a 2.75% foreign transaction fee. Also, looking at the fine print in the terms and conditions I do not see under “Membership Rewards Points on Eligible Purchases” where you get 2 points for dining, even though their main page indicates that you do. To me that’s confusing. Also, the travel category is much more limited than it is with the other cards that you mention. For example, there’s not extra points for cruises, car rental, etc. and the airline tickets have to be booked directly with the airline. And then there’s the .0006 max. $99 “Points Transfer Fee” to airlines that they’re the only one that charges. I’d love to get excited about Amex’s card as I’ve been a LONG time Gold and Platinum Member, however they still have a long way to go to catch up to Citi and Chase in this race. Getting a little closer, but still really behind IMO. @lucky Thanks. I need to pay more attention! 🙂 That does move them a lot closer to CSP, and the 50,000 point bonus (if you can get it) makes it very attractive. @ Lucky, my wife and I want to start using CCs for points. We would like to travel to the Caribbean and Europe…and it appears that AMEX points are better than Chase for us (i think). Do you think it’d be better if we get the Everyday Preferred and after 3 months we also get the Gold?